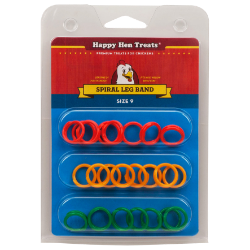 These easy to apply plastic spiral leg bands make it easy to keep track of your chickens. Use to identify different breeding stock, track age or simply identify two similar birds. Bands are easy to apply and work similar to key ring. Bands should fit loosely. Never use a tight fitting band as it may cut off circulation. No tools required. Uncoil spiral band and place the bird’s leg inside. Allow band to close completely around the leg to its original shape. Do not allow a tight fit. Not a toy. Keep out of reach of children. Ameraucana, Ancona, Bantam Cochin, Cubalaya, Fayoumi, Faverolle, Hamburg, Lakenvelder, Leghorn, Mille Fleur, Polish, Silkie. Barred Plymouth Rock, Barnevelder, Black Australorp, Buff Orpington, Delaware, Dominique, Faverolle, New Hampshire Red, Rhode Iland Red, Speckled Sussex , Silver & Golden Laced Wyandotte, Welsummer. Note: Sizing is a guide only. Remove leg bands from growing birds if bands become tight. Bands should fit loosely enough to move freely on the leg.